The road to heart health starts with a fork. Not the fork in the road, but the fork with which you eat! Our health is more significantly impacted by what we eat than anything else. Think about this: Your body is built by what you put into it. Your heart beats all day and all night. It never rests. If needs to be cared for or it will stop prematurely. Three major things our hearts need be healthy are good nutrition, exercise and good blood flow. Proper nutrition is the most important of the three, because without proper nutrition, you cannot exercise to capacity and your arteries get clogged and enflamed, leading to heart disease. 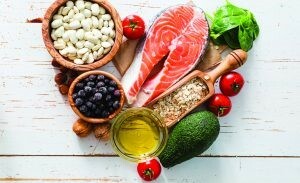 The easiest way to heart health is to follow a Mediterranean Diet style of eating. It’s pretty simple if you follow my take it or leave it plan when you are just starting out. These are very general guidelines. But if you start with removing one bad choice a week and replacing it with a better choice, you are on the right track. For example, let’s say you have toast and coffee with cream and sugar every morning for breakfast. Switch out your toast for some old fashion oatmeal. I don’t meant instant oatmeal. That’s refined and not good for you. Add a handful (1/2 cup) of berries or another favorite fruit. That’s heart healthy! Now for that coffee. Switch the cream to organic 2% milk, and cut the sugar in half. That’s a real improvement in just one week! Refines Oils: Soybean oil, canola oil, cottonseed oil and others. Hydrogenated oils/trans fats like margarine, movie theatre "butter"
Exercise: You've Got to Move It, Move It! Your heart needs action! You need to get up and move on a daily basis. Start by waling just 10 minutes a day and work your way up to 30 minutes per day. The benefits are astounding. Moderate intensity walking has many health benefits. Your heart needs an uninterrupted supply of nutrient and oxygen rich blood. We talked about the nutrients and oxygen. Now let’s talk about blood flow. Blood flows best when blood pressure is within the normal range, and there are no cholesterol deposits narrowing the arteries, slowing or blocking the flow of blood. Blood needs to be the right consistency as well. We don’t want it to be too thick or too thin. So take care of your ticker! Start the basic take it or leave it plan. Take your supplements. Walk. Drink lots of water and keep the salt to a minimum. That’s a great start. See your natural health practitioner for a custom designed program that will have your heart as healthy as possible, and you feeling great and looking fabulous for a long time! Let’s face it, many of us haven’t paid much attention to our hearts. We ate the wrong foods, didn’t exercise, and did not maintain our blood vessels. So now we have high blood pressure, diabetes, elevated cholesterol, hardening of the arteries, and possibly a few complications that go along with those issues. To attain optimal health again, our bodies are going to need extra help. Intravenous nutrient therapy can really help reverse the damage. One excellent option is EDTA Chelation has many heart related benefits. The TOP New Year's resolution is fitness! Sixty nine percent of Americans want to be fit and healthy in the new year. We all want to be healthy and mobile into our retirement years. So how do you get fit and stay fit? It's a lifestyle thing. Perhaps the most important thing you can do for your body is to move. It can be any kind of movement. Too much sitting makes muscles tight and weak and consequently prone to injury. It makes joints stiff and weak too, so they are less able to handle impact or strenuous use. So get out and move! Incorporate movement into your daily life. Get up and walk around during the day. Park as far away as possible. Stand instead of sitting when appropriate. Get into a regular exercise routine. Walking is great and you can do it anywhere. Yoga is a wonderful way to gently exercise muscles and joints, building core strength to protect your back and neck. Do anythin you like! If it's been a long time since you exercised, see your health care practitioner for the "all clear" before you start a strenuous workout routine. You need more oxygen! Most of us do not breathe deeply because of poor posture and habits. When you inhale, your abdomen should rise. When you exhale, your stomach should fall. Watch how babies breathe. Concentrate on your breathing for a few minutes each day. Breathe slowly and deeply, using your abdomen correctly. You will feel energized and clear headed! For some added O2, go to your holistic health practitioner for a powerhouse treatment of hyperbaric oxygen! You will breathe nearly 100% oxygen under pressure for an hour. The added oxygen will benefit your body and your brain. It also improves endurance and helps you to recover faster from strenuous exercise. You can NOT exercise your wa out of a bad diet. Americans eat too much fat and sugar. Our portions are too large with too much bad stuff and not enough good stuff. Focus on getting nine servings of fruit and vegetables every day. That means a salad and two vegetables with dinner, and fruit with breakfast and as a snack during the day. Fruit juice does not count! If you do that, then you will have much less available space for junk food. Remember to cut the sugars and fats. Almost 70 percent of adults in the United States are overweight or obese and 40% will be diagnosed with type 2 diabetes. Both diseases are about what you eat! If you are unsure about a healthy diet, see a holistic practitioner who can educate you about eating healthy and staying fit. Take your vitamins! Yes, we know that you should be able to get all your nutritional requirements out of your food. But let's face it, you just can't eat that much! Soil is depleted of vitamins and minerals, making the food we eat less nutritious. But we don't eat right either. When is the alst time you had 9 servings of fruit and vegetables in one day? It's a challenge! Give your body the fuel it needs to be healthy. Take high-quality vitamin, mineral and antioxidant supplements. Not sure which ones are right for you? See your holistic health practitioner. She can provide the exact formulas that are right for you. You may need some vitamin, mineral and antioxidant intravenous infusions. Intravenous vitamin therapy is a fantastic way to immediately improve your nutrient status and feel better fast! Stress kills! We are all under an enormous amount of stress. Stress can contribute to weight gain, high blood pressure, heart disease, depression, low immune system function, premature aging, stomach and digestive issues, irritable bowel syndrome, and many other health disorders. Learn to carve out time to relax. You can go for a walk in a quiet area or on the beach, meditate, go fishing, work in the garden, go to yoga, listen to music, or anything that relaxes you. Don't skip the ZZZZZZ's. People who don't get enough sleep have a difficult time losing weight and finding the motivation to exercise. Lack of sleep also effects your immune system, making you more susceptible to colds, flus, and whatever crud is going around the office. Having a hard time sleeping? See your holistic health practitioner for help with this. She can help you resolve your problems and get a great night's sleep. It's important to play. Life is short. Enjoy! Play brings joy. It improves creativity and problem solving. It can improve relationships and help to cultivate emotional healing. Joy stimulates endorphins, and endorphins have numerous benefits for our minds and bodies. Not sure how to play? Hang out with your kids, grandkids, nieces or nephews and just let them lead. Don't be afraid to be silly! How we look affects how we present ourselves to the world. Like it or not, it also affects how the world sees us. When we look good, we feel good. Staying in shape is part of it, but not all of it. Take care of your skin too! It is an outside reflection of inner health. Have a facial regularly and use high quality products. Keep your skin moisturized and protected from excess sun.